7 PIECE SERVICE FOR 10 PLUS. 10 PIECE SERVE WARE SET. 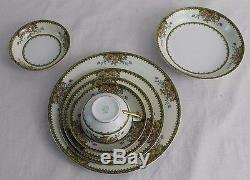 This is the only complete set of this Antique Noritake N3373 Pattern in known existence. If there is another it is kept well as a family heirloom. Even if another set exists it is nearly impossible for it to be in such pristine condition as this set. This 100 plus year old china looks showroom or factory new. There is not even a hint of crazing and the finish is absolutely without wear. There is no doubt that this set was used but a handful of times in the past 100 plus years. I'm sure it adorned a few at most china cabinets. It more than likely adorned a few formal dinning room tables as display only pieces. 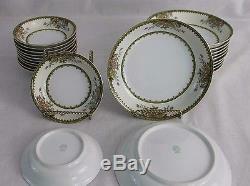 You could proudly entertain Presidents and dignitaries with this exquisite china. A family wedding party or favorite Holiday gathering. As you may well be aware, the Nippon Valley of Japan produced the absolute finest of Eastern China. 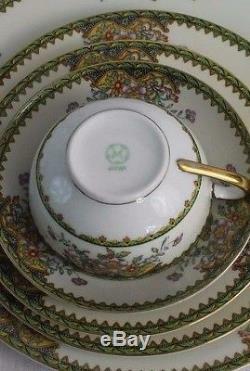 Noritake was its finest producer. It is estimated that this set may have been produced as early as 1905 - 1907. The estate this set came from was worth millions. I'm sure it may have only passed through two generations of family. It was cherished and the dinning room it adorned was beyond beautiful. This set consists of the following pieces. 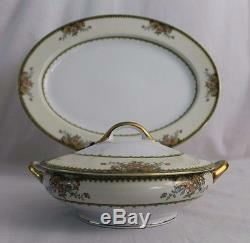 1 LARGE OVAL PLATTER 16" x 12". 1 SMALL OVAL PLATTER 11 3/4" x 9 3/4". 1 ROUND COVERED SERVING DISH 7 3/4" x 2 1 /2" WITH LID 4 1/2. 1 GRAVY BOAT WITH ATTACHED UNDER PLATE 9 1/4" x 6". 1 OVAL VEGETABLE BOWL WITH HANDLES 10 1/4" x 8 11/16" x 2 1/2. 1 CREAMER 2 10/16" H x 2 14/16" w DOES NOT INCLUDE LIP. 1 SUGAR BOWL WITH LID 3 1/2" W x 3"h - 4 1/2 WITH LID. 11 DINNER PLATES 9 3/4. 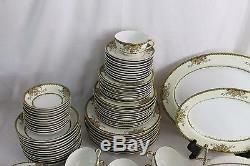 12 SALAD PLATES 7 3/4. 10 BREAD/DESERT PLATES 6 1/2. 12 FRUIT/BERRY BOWLS 5 1/8" x 1 1/4". 11 COUPE/SOUP BOWLS 7 1/2" x 1 1/2". 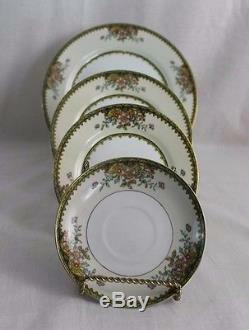 10 FLAT CUPS 2" H x 3" w.
It describes the condition and rarity of this china. This particular set is in new like condition beyond the highest level of expectation and is a set rather than an individual piece that can be valued well over a thousand dollars by itself. It is noted that on top of being very rare it is extremely rare to make such a find of Pristine condition dinnerware as these pieces are. We know how disappointing it can feel when an item arrives damaged due to poor packing practices so we take every precaution possible to ensure the arrival of your item is an enjoyable experience. All fragile or breakable items are carefully wrapped using plenty of bubble wrap and boxes that allow plenty of room for packing peanuts. We have several similar products and a variety of other items you may be interested in. 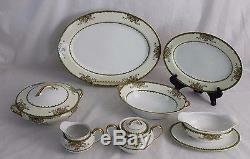 The item "ANTIQUE Noritake N3373 Rare China Dinnerware Set with Serveware pre Circa 1920" is in sale since Monday, October 02, 2017. This item is in the category "Pottery & Glass\Pottery & China\China & Dinnerware\Noritake". The seller is "stidhle" and is located in Union, Kentucky. This item can be shipped to United States.